Discussion in 'The "Juice Box"' started by Cutlass, Nov 4, 2018. The 8.5 needs about a 3/4” shorter drive shaft. I believe there is about 1/2" difference in length between a 400 and 2004R so it should be close. Thanks Larry, you are really a living archive. Some time ago I found below date. For whatever reason the data does not match. If I believe below, then the difference in between TH400 and TH200-4R is 29-281/4 = 3/4. That would perfectly compensate the 3/4 of the axle. Go figure. I guess I will have to do my own measurements. For now it is sufficient for me to know that it will be in the ballpark. Next thought: In order to get the trans out and in I want to remove the exhaust. Everything is welded and I wonder if it would be possible to remove the exhaust as one-piece unit on a "real" hoist with enough room to tilt the exhaust. With my limited height on the Quick Jacks it will not be possible at all, but I am still curious. I plan on cutting behind the mufflers, so I would have 3 pieces: Bigger one with the left and right muffler and the pipes going to the manifolds and two smaller ones (left and right bows above axle). What do you guys prefer? Buy some flanges and have them welded in front of the mufflers so that you can drop that section out and bolt it back together. Ok, if I got that right, the mufflers would remain installed and the section with the connecting tube and the pipes to the manifold would be dropped? If that is working, it is way smarter than my initial plan. Yes, you cut the pipe in front of the mufflers and weld flanges in. That way, you can just unbolt the entire section. I have that, I unbolt the headers and in front of the mufflers and my entire X pipe drops out. Flanges are the best, as Larry stated. A "band clamp" is a good fix until you get the flanges welded in. Ball Flanges - can't disagree Doug. Don't know what kind Larry uses. Whatever you do use quality components. I am going to get those and weld them in. Ball flanges are also an option. Benefits are no gaskets and some adjust ability. 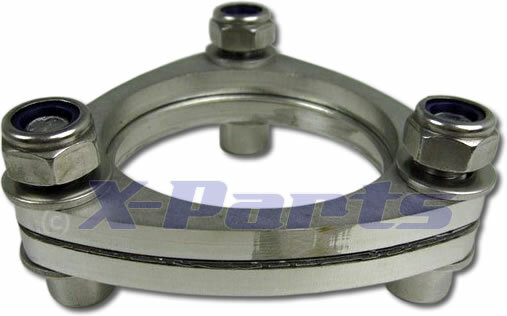 I have the 3 bolt flanges like pictured above. Made some progress today. Got the TH400 out. Boy is that thing heavy. The TH200-4R I can lift alone, but with the TH400 I gave up and asked for some help. I am getting used to my quickjack. Not a hoist, but way better than working with jacks. The flanges of my head pipes are mounted different. I wonder why. Is there a trick to it? I would think the flange in the right picture has the correct orientation. Am I wrong? The balancing wheigt on the flexplate is welded on the side of the Torque converter. With the TC of my TH400 that was no issue, as the weight was sitting in between the lugs. My new TC has no single lugs, but a ring, accordingly there is interference (I marked the outer shape of the ring with black marker on the flexplate). Should I get a new flexplate (due to the warp) and hoping that there will not be a balancing wheigt which interferes with my TC, and if so what would be a good source? I'd ask Jim Weise what to do. I'm sure he's run into this more than once. Did you check the play in the converter to the fly wheel. Most specific a maximum distance. You can put a small spacer or a few washers between the flywheel and the torque converter. There needs to be at least 1/8" and no more than 3/16" (or 3.2mm to 4.8mm) clearance between the flex plate and the torque converter. Of course if you haven't put it in yet, you can't know that measurement. If the flex plate isn't cracked, it is likely OK beyond clearance issues. I think most flex plates have weights welded on similarly. Once bolted to the crank and the torque converter, it won't move much. That's why they call it a flex plate. All stock flex plates have a bevel in the middle. That is normal. If the you can watch the gear end moving back and forth, that can be a problem. All Buick flex plates have a weight attached. Buick torque converters have pedestals so this is not a problem. The Chevy stuff has a continuous ring. This is a picture of the SFI flex plate and 9.5" converter I got from Jim Weise. In the meantime I did another check. I attached the flexplate to the crank with all bolts tightened and measured the runout @ the ring gear. It is much less, so I feel comfortable continuing using the flexplate. Next I will measure the axial position of the lugs of the TC in the TH400 versus the ring of the TC in the TH200. If I would need spacers anyway, I can leave the balancing weight where it is. If not I will relocate it to the engine side of the flexplate. As it looks, the SFI-flexplate also has the weight attached on the transmission side, so I would run into that issue also with a new flexplate. Some flexplates have the weight on the engine side. All the stock ones I have seen have it on the transmission side. My engine when built had an SFI flexplate with the weight on the engine side. It also had no bevel, it was completely flat in the middle. It gave me starter engagement problems so I replaced it when I did the torque converter. When you install the transmission, push the converter all the way into the transmission. Then measure the distance between the flexplate and converter mounting. .080- .1875 is the spec. Any more than .1875” and you’ll need washers to get it in spec. Checked the position of the lugs/ring of the two TC's relativ to the bellhousing. Less than 0.039" difference, and accordingly less than the height of the balancing weight. So the weight had to move. Drilled out the stock spot welds and made two thru-holes for exact positioning of the weight on the engine side. Done with the welding (and done with the day). Tomorrow I will do the cleanup and painting. By the way, did any flexplates came stock blue colored? There is a blue layer underneath the red paint. 1975 and 1976 Buick big blocks were blue. Had second thoughts about the runout and decided to straighten the ringgear. Was able to reduce max runout of the ringgear from about 0.06" down to 0.01", using patience and my 20to-press. Hardest part was to get my wife to agree that I use her granite countertop in the kitchen as base to locate the high and the low spots of the ringgear. I focused on the ringgear, as this is the sturdiest part of the flexplate. The sheetmetal portion of the flexplate gives, once mounted to the crank and the sturdy ring of the TC. Will do the cleanup after Eastern and will let my boy do the spray painting (can) of the flexplate. Same way I learned a lot from my dad.